A handsome smaller lantern with a traditional, but simplified shape. 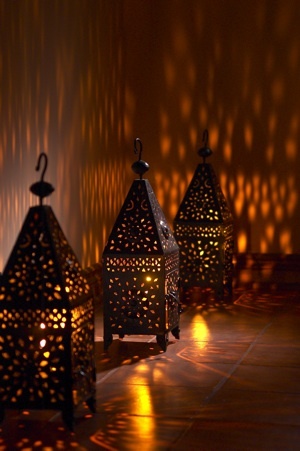 A row of these lanterns along a deck, or down a flight of stairs looks fabulous any time of the year. 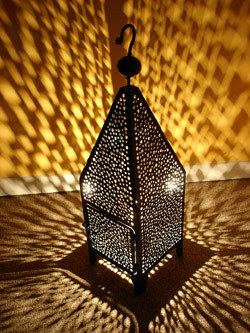 Same size and shape at the lantern above, but instead of the carved pattern this version has the hand drilled pattern which gives a lacy effect when lit. The combination of the streamlined shape and non traditional finish give a very modern look to this lantern, but it really was made in Marrakech! 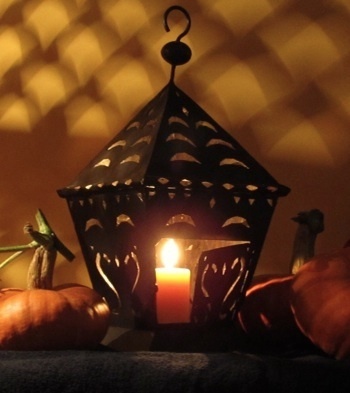 Simple but highly effective, a pillar candle will create fabulous Halloween patterns on any nearby surface with this lovely, traditional iron lantern. The design is an updated version of the style which used to hang over the archway to the old inns of the medina.